Voronezh Association of English Language Teachers is the oldest provincial Association of such kind in Russia. It was formed in March, 1992 and was the first to join TESOL-Russia in 1995. When in 1997 TESOL-Russia was converted into National Association of English Language Teachers Voronezh Association became a chapter of NATE. Nowadays the Association numbers about 150 members. It actively cooperates with the English Language Office of the American Embassy in Moscow, the British Council, Oxford University Press, Cambridge University Press and Addison Wesley Longman Publishing Houses, Dinternal International Book Distribution, Centercom. Members of the Association are united into several Special Interest Groups: Business English, Young Learners, Translation, ESP, Cultural Studies, School Integrated Courses, American Communicative Behavior. The Association has organized six contests of students' compositions in English - "The English Language and I" (1994), "If I were the President of ..." (1996) and "An Educated Person is ..." (1998), "Facing the Millenium" (2000), "English in the New Millennium" (2002), "I have a dream..." (2004). It also organizes students competitions in English. 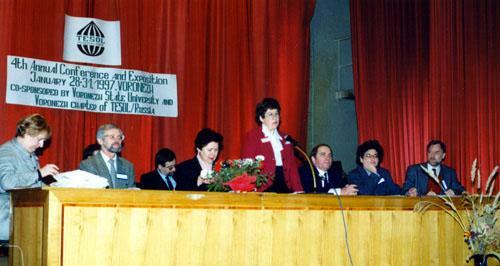 In January 1997 Voronezh Association of English Language Teachers together with Voronezh State University co-hosted the 4th Annual TESOL-Russia conference. The motto of the conference was "The Pleasures and Joys of TESOL" and the Association did its best to help the participants to enjoy the pleasures and joys of teaching English, the pleasures and joys of being a part of the English language teaching community. Professional contacts and discussions, plenaries, workshops, SIG sessions, a wonderful publishers' exhibition, a tasty opening night reception, an amazing ballet called "1001 Nights", a gorgeous Oxford University Press reception at the Opera and Ballet Theater, several raffles, including the "prizes for all" ultimate drawing, awards for presentations that best reflected the conference's theme - all these contributed to the pleasant and joyful conference atmosphere. About 400 people from various parts of Russia, including very distant regions such as Vladivostok and Ekaterinburg, participated in the conference. There were also about 30 foreign participants from the USA, Great Britain, Poland and the Ukraine. A good result of the conference was the fact that more than one third of the participants were secondary school teachers. Voronezh Association of ELT established "sisters relationships" with NYS (New York State) TESOL and in December 1997 signed a joint project with NYS TESOL on comparative studies of Russian and American communicative behavior. The agreement on the joint project lasted for 4 years and resulted in two joint publications in Russian "An Essay on American Communicative Behavior" and "American Communicative Behavior" (Voronezh 2001). It should be mentioned that this is the only research project of TESOL "sister" affiliates. In March - April, 2002 Voronezh Association of English Language Teachers celebrated its 10th anniversary. The anniversary was marked by publication of the booklet "English in the New Russia" describing the work of the Association during the decade. The opening of TESOL-Russia conference in Voronezh.